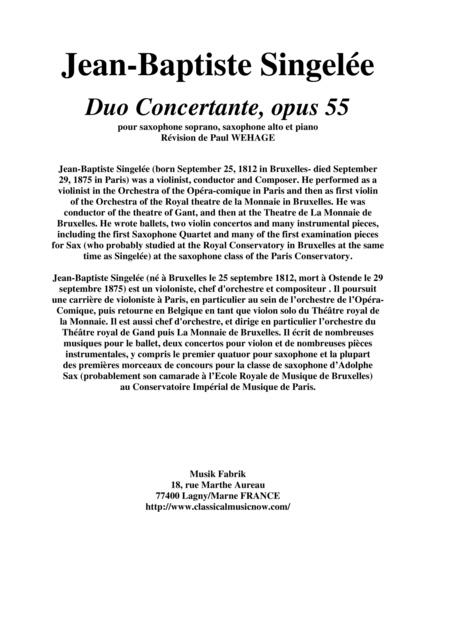 Composed by Jean-Baptiste Singelée. Arranged by Paul Wehage. Romantic Period, Repertoire. Score. 55 pages. Published by Musik Fabrik (S0.47839). Jean-Baptiste Singelée (born September 25, 1812 in Bruxelles- died September29, 1875 in Paris) was a violinist, conductor and Composer. He performed as aviolinist in the Orchestra of the Opéra-comique in Paris and then as first violinof the Orchestra of the Royal theatre de la Monnaie in Bruxelles. He wasconductor of the theatre of Gant, and then at the Theatre de La Monnaie deBruxelles. 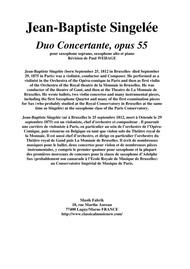 He wrote ballets, two violin concertos and many instrumental pieces,including the first Saxophone Quartet and many of the first examination piecesfor Sax (who probably studied at the Royal Conservatory in Bruxelles at the sametime as Singelée) at the saxophone class of the Paris Conservatory.